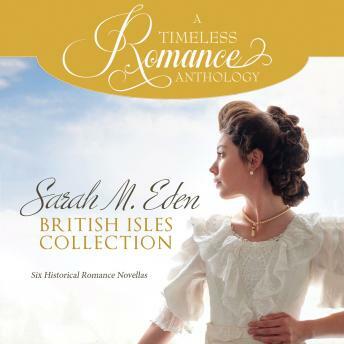 With two new novellas and four reader favorites, Sarah M. Eden fans will love this collection of stories set in her beloved British Isles.This collection includes The Road to Cavan Town where sweet Alice Wheatley tries to catch the eye of Isaac in her own unique way. Will it be worth the effort? Then, in A Christmas Promise, Sean hopes to start a new job as a stablehand in Kilkenny Castle, but Maeve Butler has to come to his rescue when he’s stuck in a muddy field. After their memorable encounter, all he can think about is her fiery wit and dark eyes.This set also includes two regency novellas centered around the London season. From Dream of a Glorious Season, Elizabeth has always loved Julian, but he’s been intended for her sister since childhood. When he helps introduce her to society, he finds himself falling in love with her. Is there too much standing in their way to ever be together? And in A Lesson in Love, the London season is to be enjoyed, but newlywed Lucy soon finds her husband Reed prefers a quiet night at home. Their battle of wills reaches epic proportions but can their love withstand the test?This is a can’t-miss collection that every fan of romance and wit should have on their bookshelf!